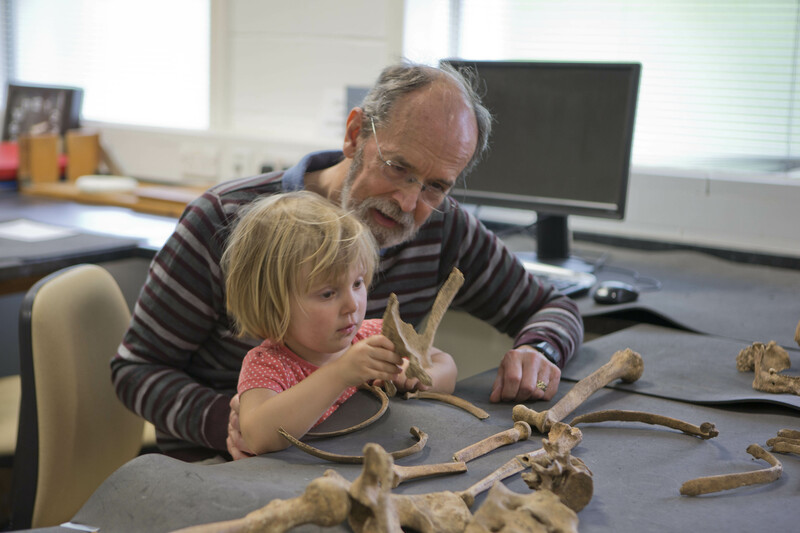 As part of the British Festival of Archaeology, people of all ages (from 3 to over 70) enjoyed a series of archaeological activities in the department on Saturday! While younger children excavated a coffin ‘burial’ complete with grave goods such as jewellery and Roman ceramics, older children explored the use of virtual reality and CGI within museums and the heritage industry. A quiz was held in which people worked out what different ceramics might have been used for (e.g. plates, bowls, roof tiles, toilets). Interesting links with economics – as people worked out what quality of ceramic ware was most suitable in terms of the investment needed to actually make the item. The Art on the Rocks involved looking at different ways of recording rock art, including using high tech photography, 3D imaging and finally making art from different time periods. 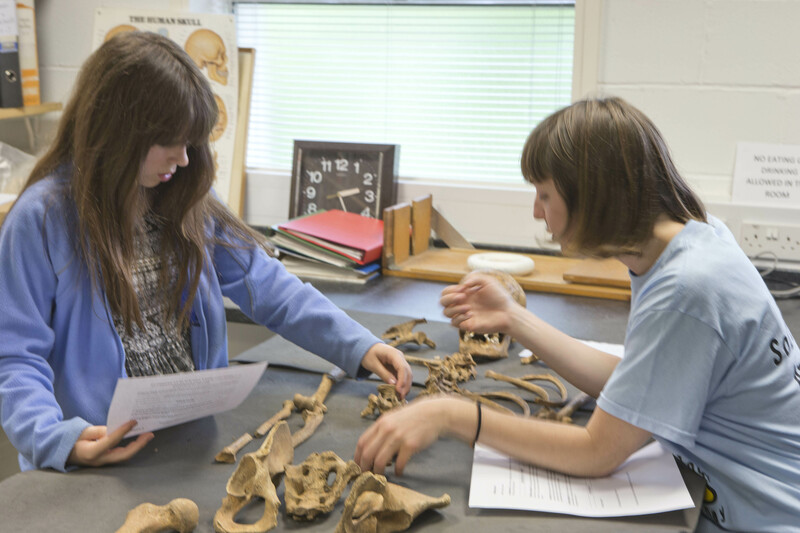 We also had people using their forensic and investigative skills in Anglo-Saxon CSI – to study the anatomy and biology of real human skeletons from the medieval period to work out their patterns of disease and then decide whether they died as a result of disease (including leprosy, TB and arthritis) or whether they were violently killed. Here you can see Ellie Williams and Ellen Wheatley doing exactly that. Cecilia Birdsall (pictured here with her grandfather Nigel) was more interested in whether bones could be used for clothing! But clothing was the topic of a separate activity. In our “How did people keep warm in the Ice Age?” workshop, animal furs and pelts were used to construct clothing and garments and then their suitability for and practicality in different environments was assessed. Different people had very different ideas! Maybe we should investigate Ice Age fashion?! The people who tried the “Fossils and tools from the Stone Age” workshop studied past hominids, including Neanderthals, and used stone tools to turn shells into Stone Age-style jewellery. We also had people working from plans and designs of boats from different time periods and cultures, to rebuild them and then test their suitability for carrying different types of cargo in our “Maritime vessels, merchants and trading” activity. Some vessel designs were definitely found to be engineered to hold more cargo and ballast than others – the flotation tank certainly saw a few boats capsizing and sinking! The virtual reality and CGI workshop included experiencing a fly-over of Basing House to investigate the way the CGI is being used to “rebuild” cultural heritage. Everyone then took turns trying to control a drone over the site without interfering with the cultural heritage. Our drone was a Darlek – who would have thought that Darleks, Dr Who and archaeology would mix so well? Great fun was had by everyone and we definitely want to repeat this kind of enjoyable and exciting day again! One Response to "Fun and Games at Southampton Archaeology Activities Day"